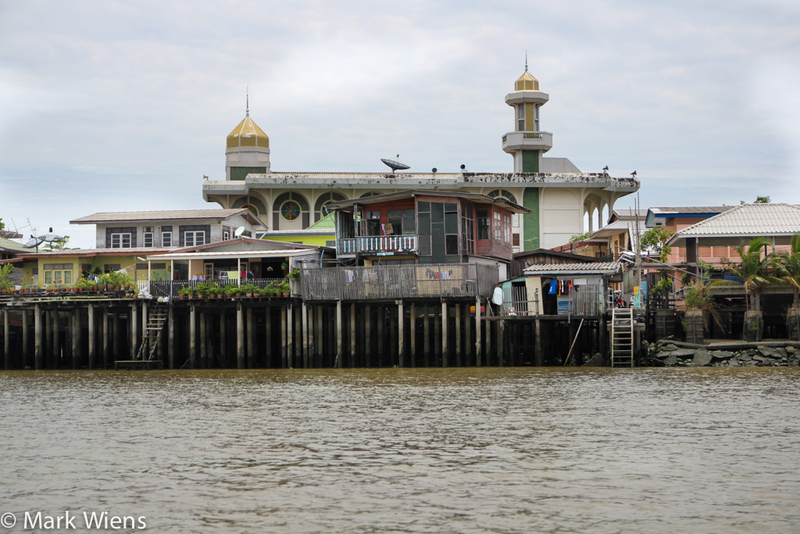 Did you know there’s an island in the Chao Phraya River near Bangkok? Just north of Bangkok, actually in the province on Nonthaburi, is Koh Kret (เกาะเกร็ด also sometimes spelled Ko Kret), an island village in the middle of the Chao Phraya River. If you’re in Bangkok, and looking for a great experience and a day trip out of the city, Koh Kret (เกาะเกร็ด) is a fun place to visit. I’ve been there a number of times now, and I really enjoy both getting there (taking local boat transportation), and also the laid-back atmosphere once you’re on the island. 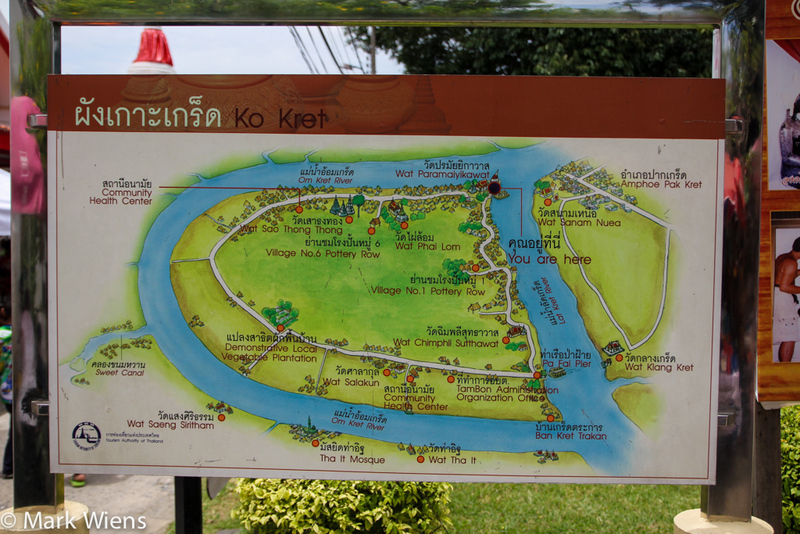 Koh Kret (เกาะเกร็ด) is not a natural island, it was formed in 1722, during the construction of a canal, now known as the Om Ket river. As the canal was widened a number of times, it eventually cup off a chunk of land, and formed what is today known as Koh Kret (เกาะเกร็ด). If you’re a good swimmer, you might be able to swim to the other side of the river, but it’s still pretty wide. The island was settled by Mon people from central Thailand, and many people living on the island now are still Mon. 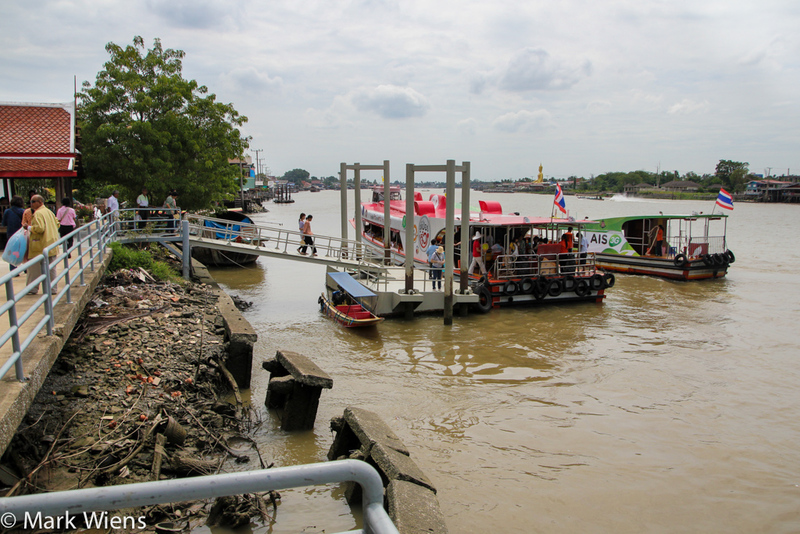 The final stop on the main Bangkok Chao Phraya Express boat is Nonthaburi Pier. 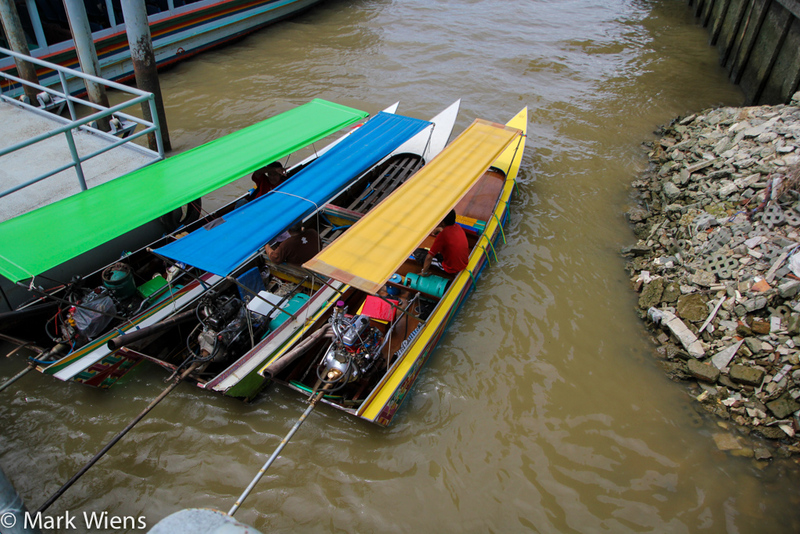 Once you arrive at the pier, there are a few stands where you can purchase tickets on a smaller boat that will take you directly to the Koh Kret (เกาะเกร็ด). 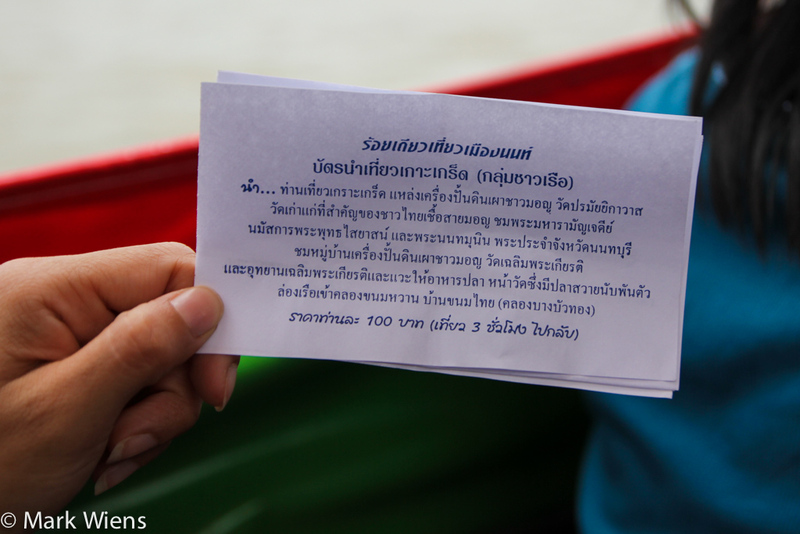 From Nonthaburi Pier, we boarded a smaller long-tail speed boat, and it took us about 15 or 20 minutes to get to the island. If you’re carrying a camera or other electronics you may want to wrap them in plastic or make sure they are waterproof, as some sprays of water from the boat are common. When you start approaching Koh Kret, you’ll feel like all of a sudden, life has slowed down a notch. 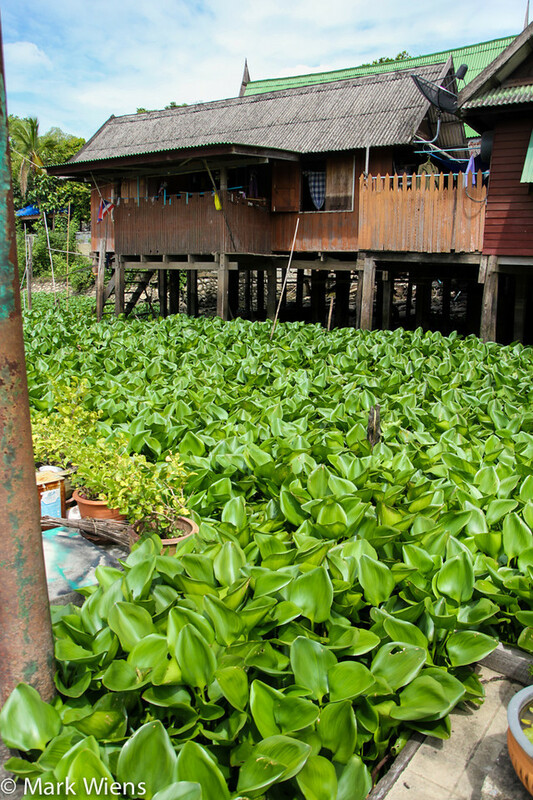 Similar to taking a day trip to Samut Prakan, Koh Kret is close to Bangkok, yet it’s a completely different world. People hang out and relax, fish along the banks of the river, take naps in their paddle boats, and it’s always a joy to escape the big city for relaxation. 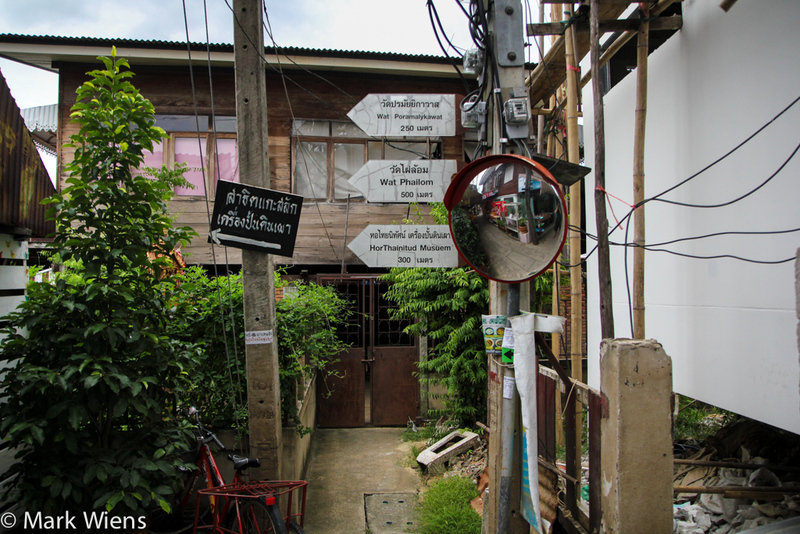 Since Koh Kret most caters to tourists, both Thais and foreigners, especially in the common areas and villages, there are good signs and maps that will lead you around. Most likely, the longtail boat will drop you off in the right hand corner of the island, near Pa Fai pier. 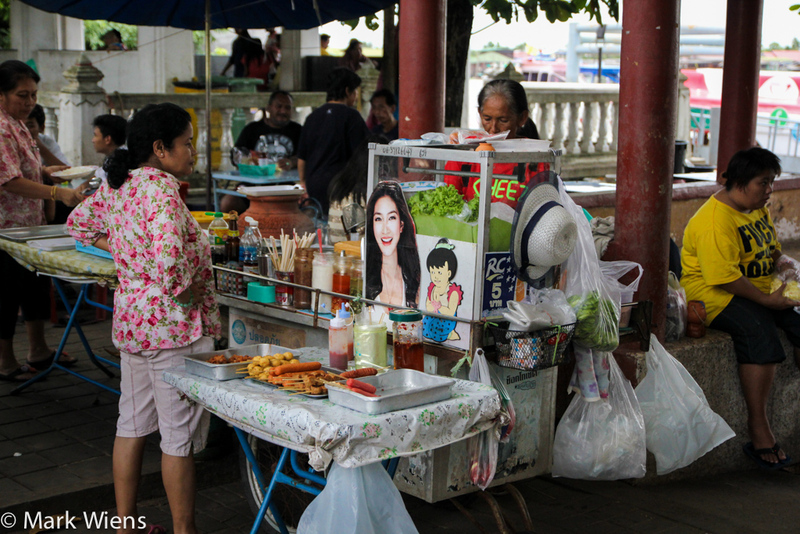 You can go to Koh Kret any day of the week, but the best time to visit is during the weekend when many vendors take to the lanes, especially around the temples, and sell food and all sorts of other random things. 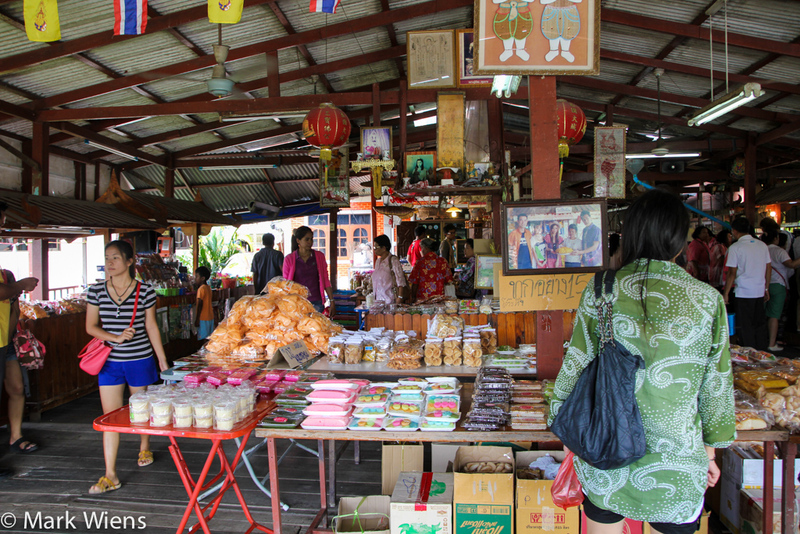 Visiting Koh Kret is a very popular activity for local Bangkok residents to enjoy a day of relaxation and eating. You can visit other days of the week, but it will be much quieter, with normal daily life, and without the market (which can be really nice too, if you’re looking for peace and quiet). Koh Kret island is sort of square in shape, and if you take a look at the map of the island above, there’s really only one main road (only pedestrian and motorbike, there are no cars), that runs the circumference of the island. Don’t worry, you can’t get lost! So no matter how much exploring you do, it’s pretty hard to get lost while wandering around the island. However, it is a bit bigger than it looks, and to walk around the entire island on the path is probably about 7 – 8 kilometers – that’s my guess. You could walk it, it you’re up for some exercise, or you can rent a bicycle, which is a nice leisurely way to circle the island. 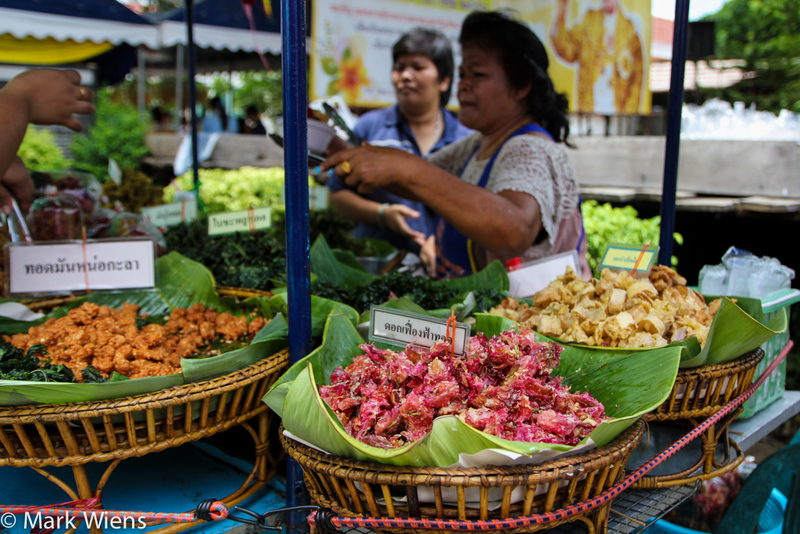 The Koh Kret market, open on weekends, occupies basically the entire eastern side of the island, and vendors easily stretch for over a kilometer – there are plenty of snacks and boutique little shops to browse through. 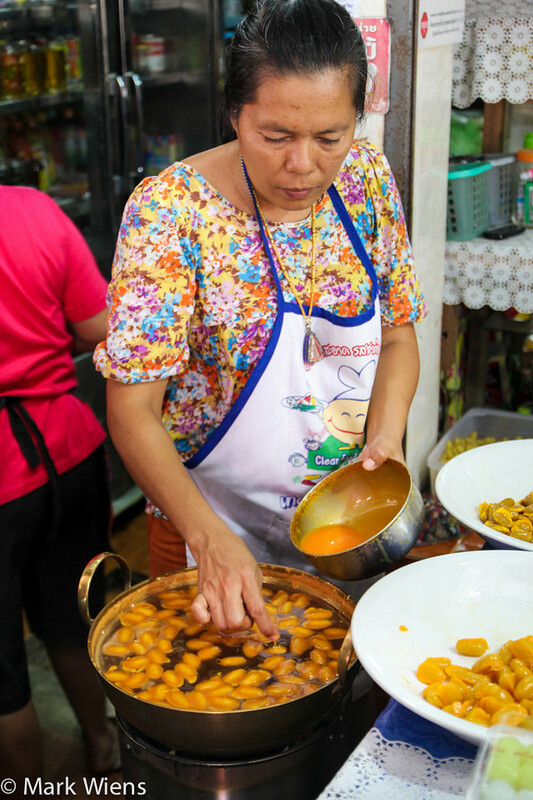 You’ll find all sorts of snacks, including a couple of famous vendors selling the Thai Portuguese influenced dessert known as foi tong. 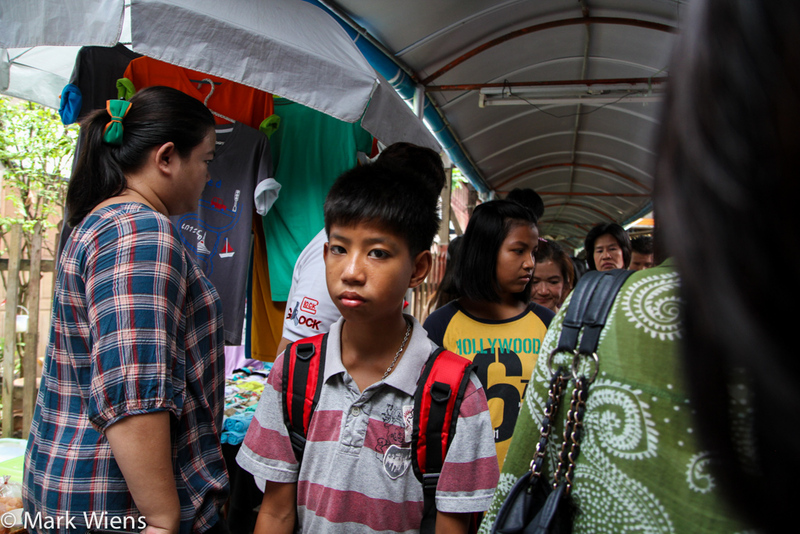 If you go to Koh Kret on the weekend, don’t try to be in a hurry walking through the market, the lane is tight, and there’s always a lot of foot traffic. The best attitude is just to take your time strolling and enjoy the nice atmosphere. A refreshing drink, or some vegetables? 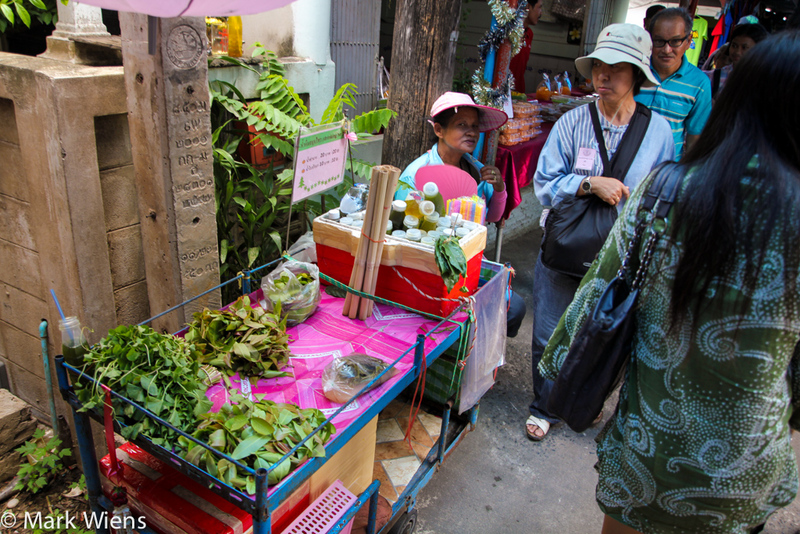 Throughout the market, and around the island, you’ll find all sorts of interesting vendors. Some sell the latest fashion and accessories, while others sell fresh vegetables, drinks, and street food snacks. One of the most famous things to see on Koh Kret island is the Mon style pottery, an art that has been on the island since its existence. There are a number of pottery villages you can visit along the route, where you can see people making pots, and the process of the art. 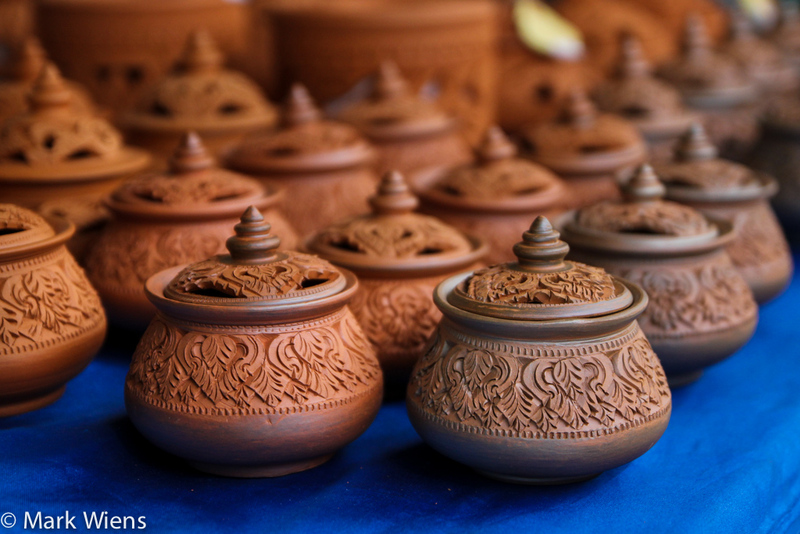 Also, you’ll find numerous shops selling artistic little pottery vessels. What I really love about taking a Bangkok day trip to Koh Kret, is getting out of the market, and the chance to explore the outer edges of the island, and the local life and culture. 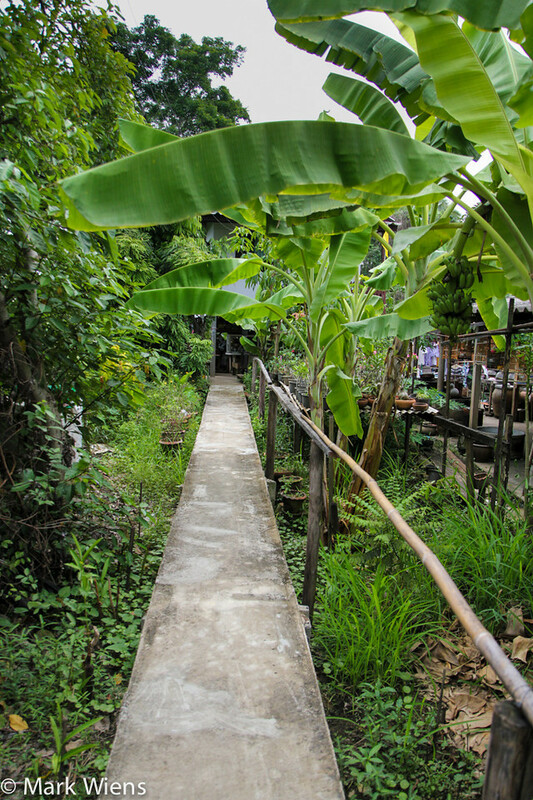 Just like areas of Bangkok’s green lung, Koh Kret Island has many elevated concrete pathways, which are a lot of fun to cycle on and walk on – it’s quite similar to Bangkok’s green lung. 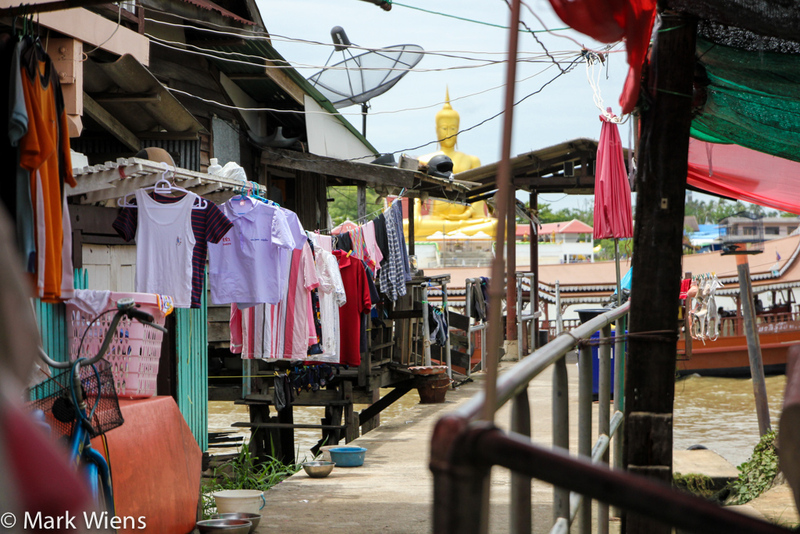 You never know what exactly you’ll come across when you walk through the less visited sides of Koh Kret. 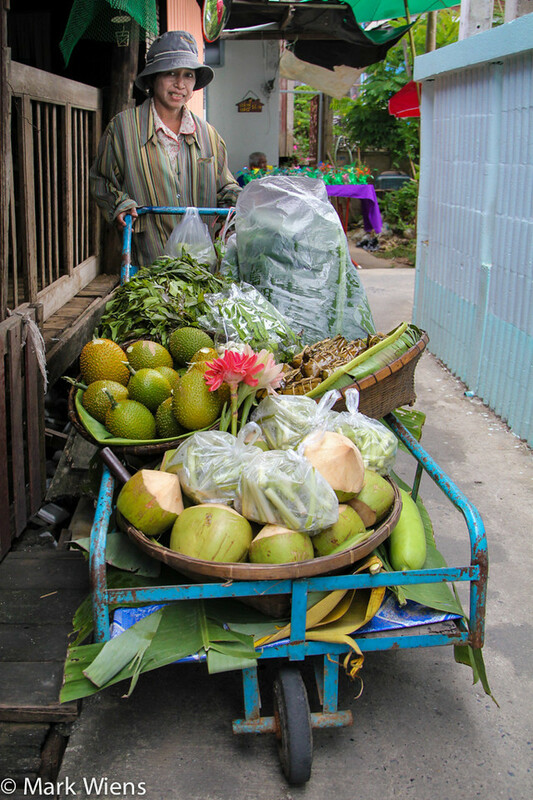 This lady had a lovely cart full of fresh fruits and vegetables, and a few prepared Thai snacks. I wanted to buy up her supply of gac fruit (known in Thai as fuk khao), the little spiky fruits in the middle of her cart. If you have time to explore the non-touristy side of Koh Kret island, it’s a great opportunity to just experience the local lifestyle and culture of the island. You’ll walk directly past homes, temples, small neighborhood shops, and restaurants. Around the island, there are a number of different village clusters, so you can walk or bike from village to village. It’s so nice to be away from cars and trucks, and very few motorbikes. 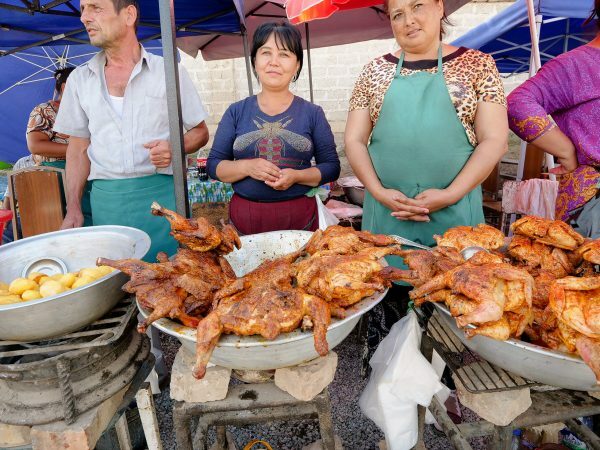 There are small street food restaurants, and neighborhood restaurants scattered throughout the island, but there are many more snacks to choose from during the weekends at the markets. 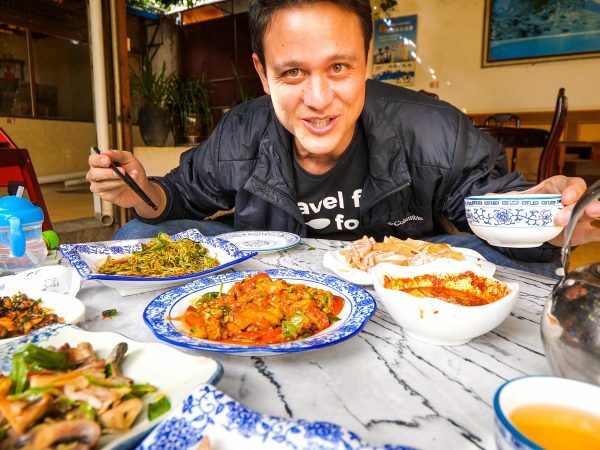 However, this is Thailand, and no matter how remote you are, food and refreshment is never too far away. I have never spent the night on the island, but if you’d like to, there are a number of local style home-stays. 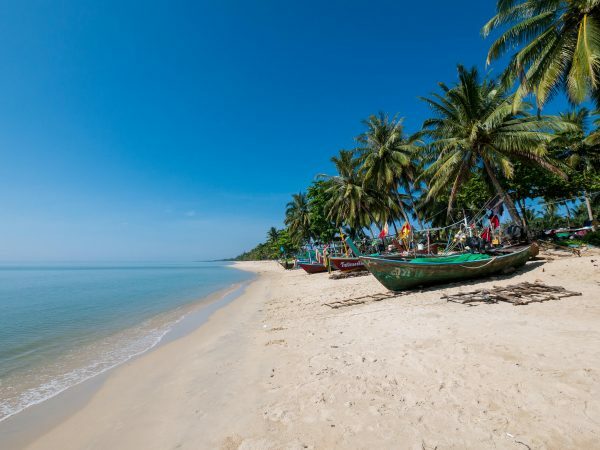 I’m almost certain it would be a quiet, extremely relaxing, and nicely cultural experience to spend a night or two on Koh Kret island, and it would certainly be a way to get out of the city for some time. If you take the long-tail speed boat from Nonthaburi, on your back, they will probably make a stop at a house on stilts known as Ran Baan Khanom Wan, or the The Thai desserts house. They probably have an agreement with the boat drivers to drop off their customers there for a visit, but it’s a good place to visit. It’s a place where nearly all Thais wander around and come out with big bags full of all sorts of different Thai khanoms (snacks and sweets). 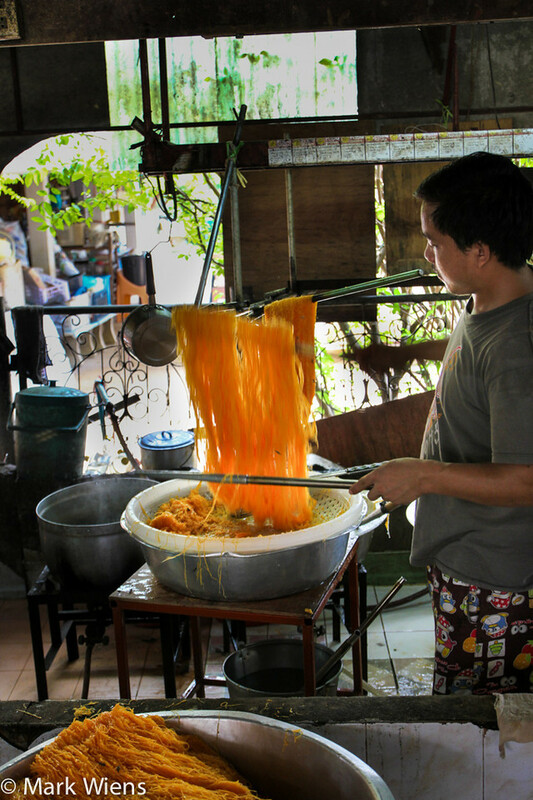 Ran Baan Khanom Wan you can watch as they make certain Thai desserts, and if you’d like, you can purchase all sorts of snacks and sweets. 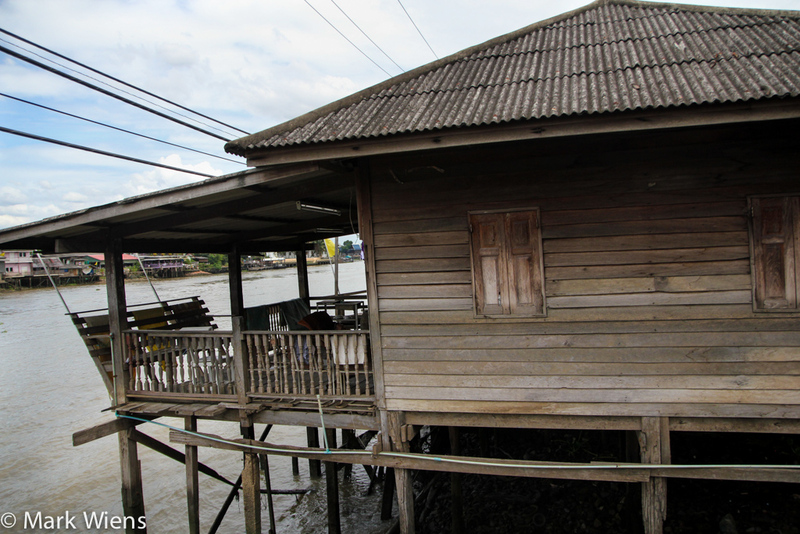 Koh Kret (เกาะเกร็ด) is an island in the middle of the Chao Phraya river, about 20 kilometers north of Bangkok. You can either get there by boat or by bus and ferry. If you’re looking for a day trip from Bangkok, and a time to enjoy some peace, relaxation, and the local culture on the island, Koh Kret makes an excellent day trip. 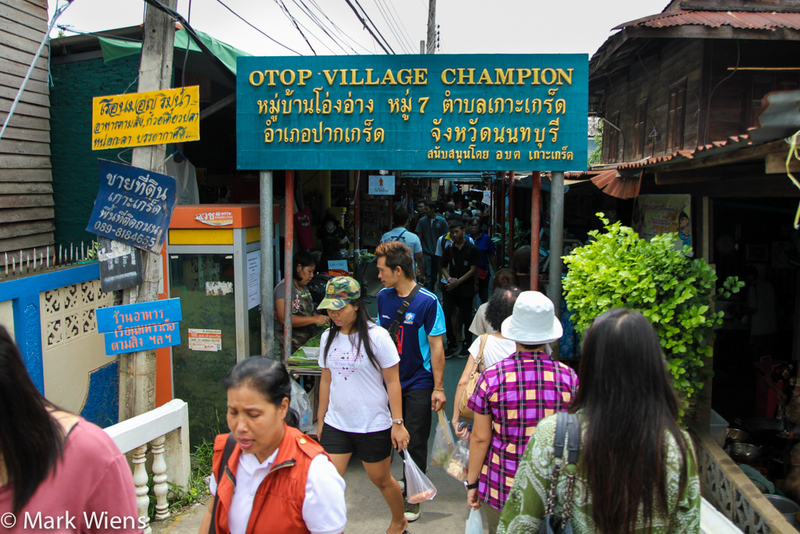 You can visit any day of the week, but the weekend is when Koh Kret is busiest and when you’ll find the most shops and restaurants available. 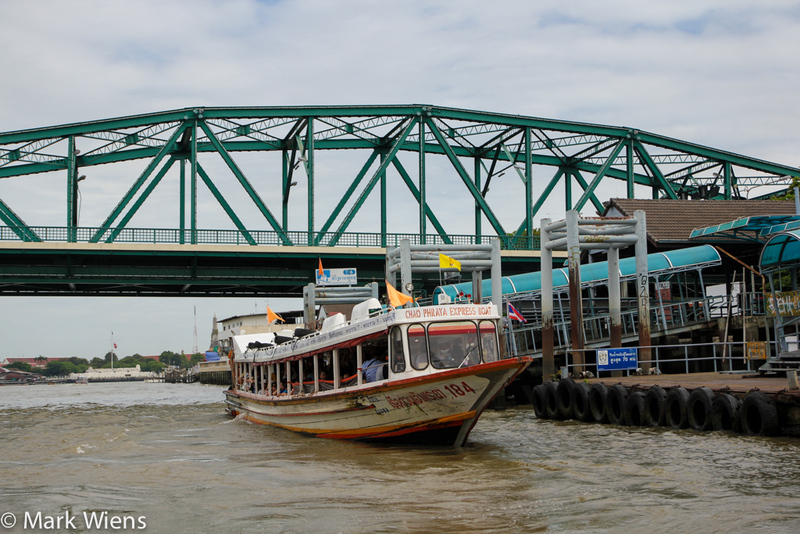 Boat – From Spahan Taksin central pier in Bangkok, take the Chao Phraya express boat all the way to the furthest north station at Nonthaburi (13 THB). From Nonthaburi, buy tickets on the longtail boat to Koh Kret Island (100 THB), or you can hire your own personal boat it you like. Bus – Take bus #166 or #104 (7 – 20 THB) to Koh Kret and get off at Wat Sanam Neua Temple, and then just take a ferry across the river (2 THB) to Koh Kret island. 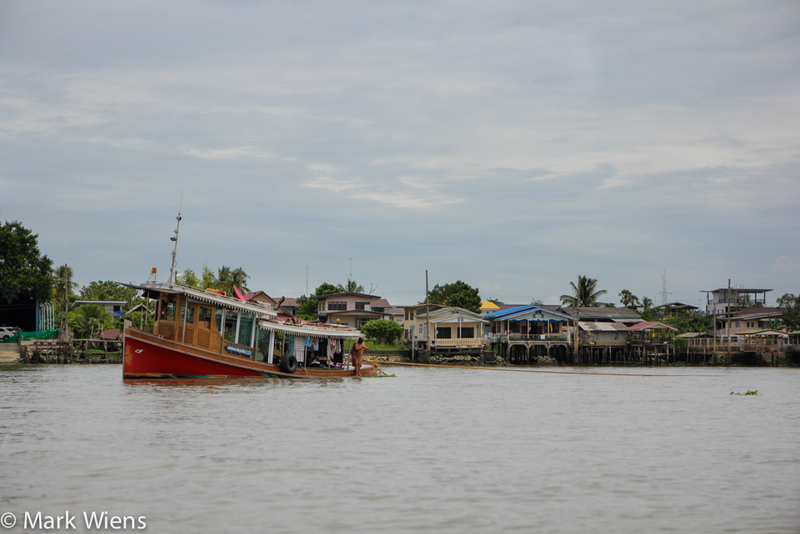 Have a great visit to Koh Kret island! I arrived at Nonthaburi at 3:00 pm and the only service to the island available at this time, so I’m told by the ticket vendors, costs 700-800 THB, depending who I ask! They tell me long tail boat service has finished! I’ve been in the boat for ages, from Thapan Thaksin and would not have bothered had this information been available. Looks fun, maybe we’ll give it a go this Sunday! Thanks Jay, hope you have a great time! Just love your website. 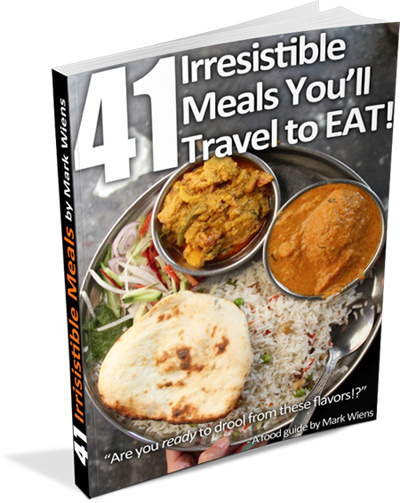 Mark Weins is the best promoter for Thailand. The country should pay you for such magnificent representation of the food and sight of Thailand. You should have your website exposed here in the U.S. Once anyone view your site it would compel tourist to want to try your exciting gastronomic adventures. You seem such a nice guy .More power to you. Huge thank you Susan, really appreciate your kind words of encouragement! Hi Susan, thank you very much, really appreciate it. Hope you’re doing well! Great post Mark, really helpfull. I’m wondering if i want to go on day trip to Koh Ret, how many hour will it take? Coz i still have many place to catch up. Hey Mark! It’s nice to see the island when it’s full of people and color. I went on a weekday and it was totally deserted – like a ghost island almost. But you know what we found? Yup! There’s a durian orchard on Koh Kret! Hey Lindsay, thanks for sharing, and glad that you found durian! The market on the island looks so colorful and vibrant. I am sure exploring this new island must be fun! Lovely pictures! Thank you very much Renuka. It really makes a great day trip away from the busy city of Bangkok. I’ve been spending a lot of time in Thailand recently and really enjoy when I can get over to Koh Kret. Great post, Mark! Thank you Rebekah, good to hear you’ve taken some trips to Koh Kret recently. nice pics and post. Looks like a great place to get away from the hustle and bustle of the city life. I was there a month or two back during the week. I found it tricky to get a boat from Nonthaburi so just jumped in a taxi to Wat Sanam Neua (80 Baht). Very quiet on weekdays, most places closed, so I escaped the circular route and explored the middle. It’s a great place to get lost. Hey Allan, thanks for the extra input and tip for getting there. Next time I’ll have to check out the middle as well. Love the look of this little place Mark, intrigued by the dessert that looks like spaghetti!!! Good photos, Koh Kret looks like an interesting place to visit to see the local culture and taste the local food as well. Good post and nice photos. Thank you for reading Sigurdur. Thank you very much Indah, I would love to explore more of Indonesia in the future.